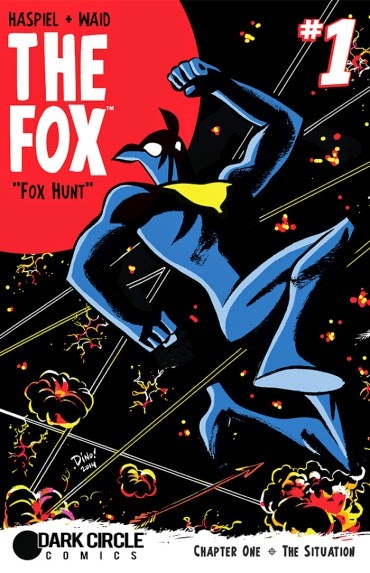 The Fellowship was fortunate enough to obtain a copy of THE FOX #1 from Dark Circle Comics (an imprint of Archie Comics). Dean Haspiel and Mark Waid write, Haspiel draws and Allen Passalaqua colors. Paul is a photojournalist on a mission to uncover corruption in a large corporation. He’s also a superhero known as The Fox. So he visits his hometown, with his teenage son in tow, to check out the “improvements” the company is planning to make. But he’s attacked by an old girlfriend who’s trying to save the town herself. When she finds out he’s the Fox, she runs off. But it’s entirely possible that Paul was right about Bright Industries after all. Many of the crimefighting superhero books out there are either mega-violent or have deeply flawed heroes. I really like that Paul/The Fox seems like a pretty normal guy. He’s got a normal job and a loving family. And he’s got a past that’s just waiting to be explored. The hometown story works beautifully for an intro issue, too. And the art is very cool; I especially liked the fungus cavern. This book is a refreshing change from the usual brooding antiheroes we’ve become accustomed to. Check it out. THE FOX #1 is available now at your FLCS or at darkcirclecomics.com.